Some data entry windows use popup menus for entering information. The Popups tab in the Preferences window allows for adding or removing popup entries. Drag and drop entries in the list to reorder the items as they appear in the corresponding popup menu. In the case of Format, this order will also determine the order used when reporting issues in various reports. The Sessions window has a popup for designating the type of session. Most sessions are "studio" sessions. But there can also be live concerts, radio broadcasts, tv broadcasts, and any number of designations for a session. The Sessions window uses a popup menu for designating the type of performance. For many discographies, Master, Alternate, and Incomplete are sufficient for describing any performance, but users can add others if needed. 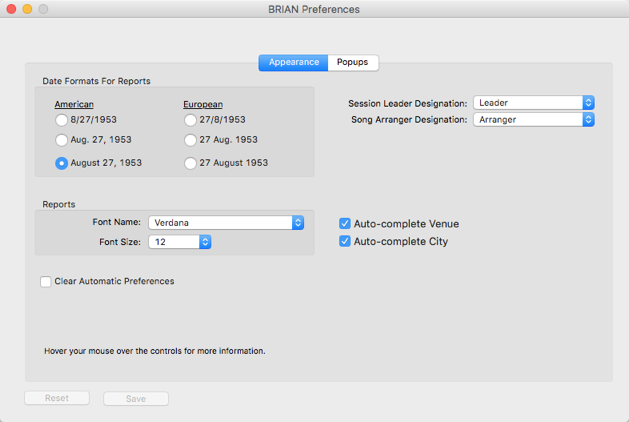 The Type Name is used in the popup menu on the Sessions window, but the Type Abbreviation is used in the reports generated by BRIAN. In most cases, a performance listed in a discography is the master take, so it is rather repitious to see that designation in the reports. If you don't want to see a take type on the report, leave its abbreviation blank. The Issues window contains a popup to show the verification status of the issue for the purpose of noting provenance of the information about the issue. The Select a Related Song window is used to link different song entries that may be the same song. Two entries can be the same song when, for instance, there are more than one set of lyrics for the same music. The Relation Type popup designates the relation. The Set Popups tab uses the 3 Step Edit Mode. To enter a new item for the popup menu, first use the popup menu to select the type of popup to be changed. Then press the New button. Pressing New will cause the Edit button to change to Save and the Delete button to change to Cancel. Fill in the Type Name and Type Abbreviation. Press the Save button to save the entry or the Cancel button to cancel. If the Save button is pressed, the new entry will be displayed in the listbox below. Drag and drop the entry to change the order in the list. To change a popup item, select the item in the listbox below. Then follow the same steps as for adding an item except press the Edit button to start the procedure. Use the Preferences window to set the date format used in reports. The Preferences window has no effect on the date format used in data entry fields for other windows. 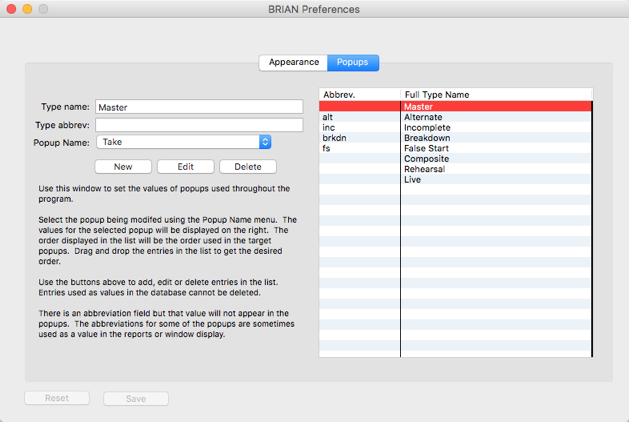 Use the Preferences window to set the size and style of fonts used in the BRIAN reports. To facilitate the options for displaying session leaders in the session report, use this popup to designate the instrument used to designate leader. To facilitate the options for displaying arrangers in the session report, use this popup to designate the instrument used to designate arranger. Automatic Preferences are ones that are stored in the preference file as opposed to preferences stored on the database. These are things like window placements and list column widths. You don't explicitly set these, instead BRIAN "remembers" the last setting you made to them. There are times where the preferences file can get corrupted and cause unpredictable results in displaying a window. If you click this checkbox and then press the Save button, your preferences file will be deleted. Checking these will enable auto-complete for the Venue and City fields on the Sessions window. This, in effect, will enable a lookup for these fields so you don't have to fully type the information. The lookup will only include items already entered in these fields.